Reserve a window seat! Inside the TWA Hotel, you can watch planes take flight. 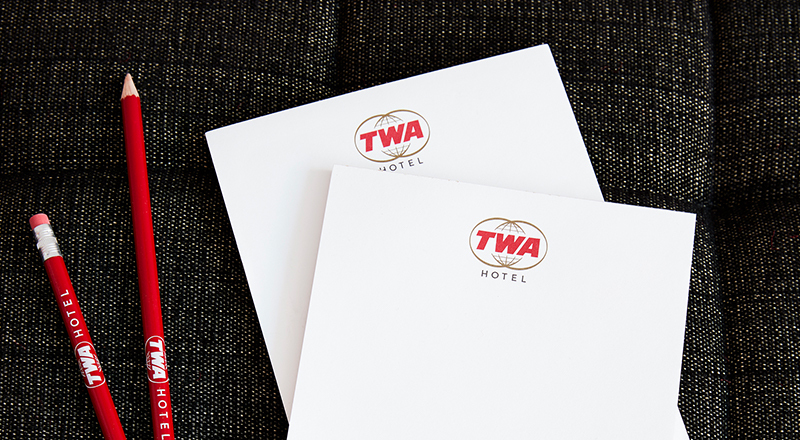 TWA Hotel’s 512 ultra-quiet guestrooms are preparing for takeoff! 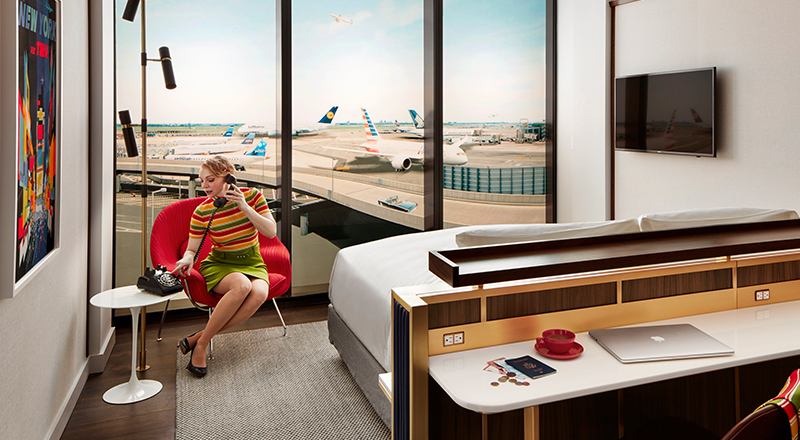 Inspired by the year 1962, when Jet Age excitement electrified the country, John F. Kennedy and Jackie Kennedy graced the White House in the golden Camelot era and The Beatles released “Love Me Do,” TWA Hotel’s guestrooms will have views of JFK’s runways and the historic TWA Flight Center. 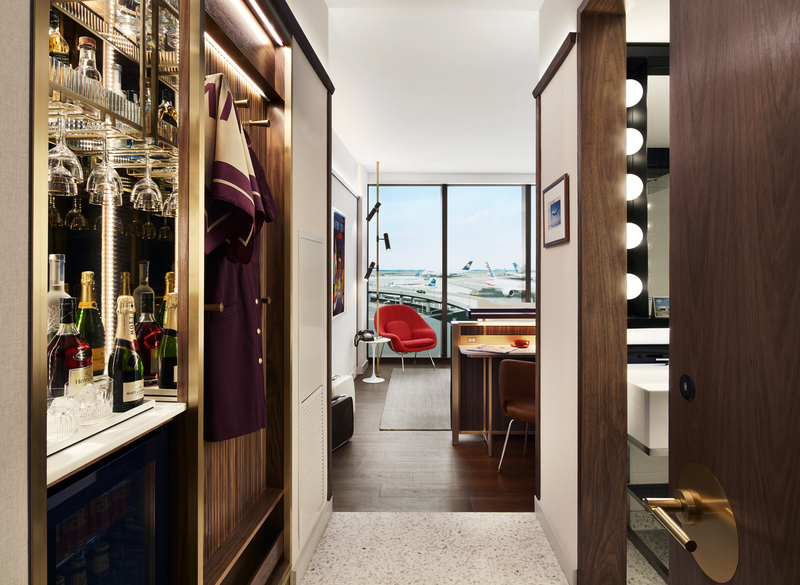 The guestrooms designed by New York City firm Stonehill Taylor will be accessible through Saarinen’s iconic flight tubes made famous by the 2002 film Catch Me If You Can. 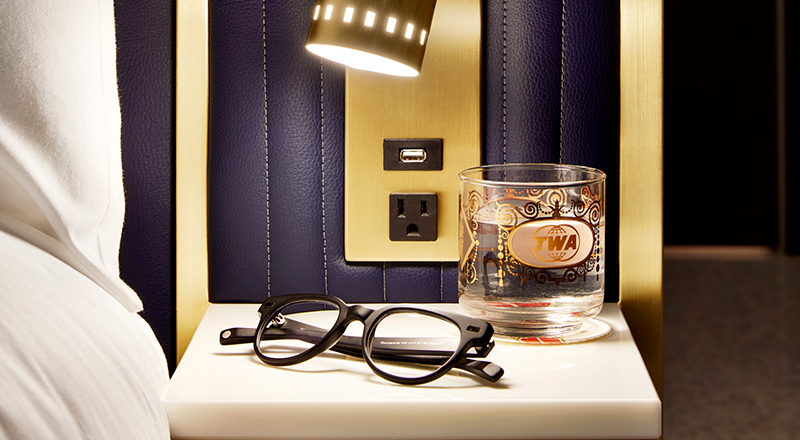 Fasten your seatbelt and enjoy some highlights of our rooms. TWA Hotel’s glass curtain wall by Fabbrica — the second-thickest in the world after the wall at the U.S. Embassy in London — is seven panes and 4½ inches thick. The glass’ Sound Transmission Class (STC) rating of nearly 50 ensures the floor-to-ceiling, full-width windows cancel runway noise. 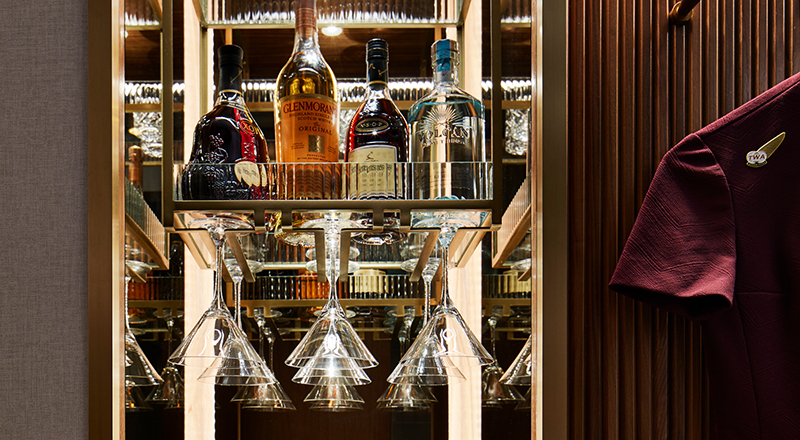 Each guestroom features a glamorous wetbar custom built from walnut, glass, mirrors, brushed brass and crystallized glass. The model room bar is stocked with the ingredients for a perfect cocktail hour: Moët & Chandon Imperial Brut Champagne, Hennessy V.S.O.P Privilège Cognac and the Belvedere Martini with Belvedere Vodka. Saarinen's classic midcentury modern furniture by Knoll is right at home in the hotel. An armless Saarinen Executive Chair wrapped in tan leather is tucked into the custom walnut, brass and crystallized glass desk. 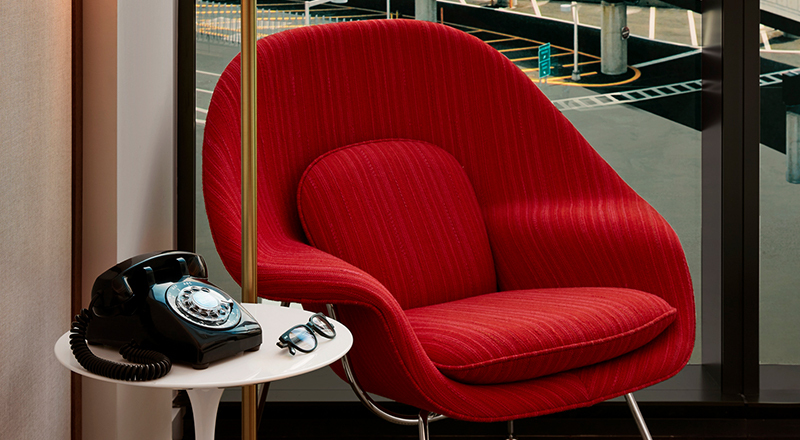 An authentic Saarinen Womb Chair, upholstered in red Knoll fabric, sits beside a 16-inch round white Saarinen Pedestal tulip side table where guests can make unlimited free international and local calls on a 1950s Western Electric 500 phone retrofitted with a pulse to tone converter by Old Phone Works. Walnut elements — ceiling trim, a tambour wall, a sliding barn door for the bathroom — soften the space. A custom walnut entryway unit includes storage, a mini refrigerator and a hidden safe. Hidden behind a walnut trim, cove lighting reflects onto the ceiling to illuminate the room. Lined in brass, a custom quilted leather-look headboard features a custom brass sconce and a crystallized glass ledge that easily holds overnight accessories. The star of the terrazzo-tiled bathroom is a custom Hollywood vanity with bubble lights inspired by Philip Johnson’s iconic ladies’ lounge in New York City’s former Four Seasons restaurant. 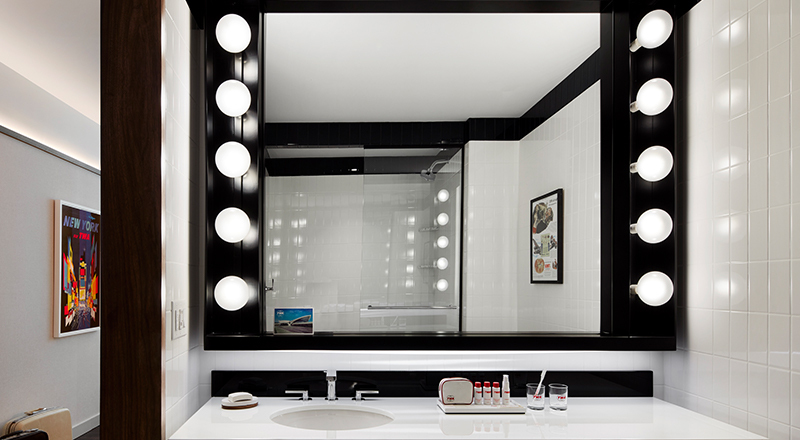 The glass-enclosed shower with linear drain is subway-tiled in white with midnight blue trim. Notepads and pencils will inspire guests to sketch their own architectural masterpieces. Carpeted in TWA’s signature red, the curved hallway features walnut trim, walnut doors and terrazzo guest room entryways. 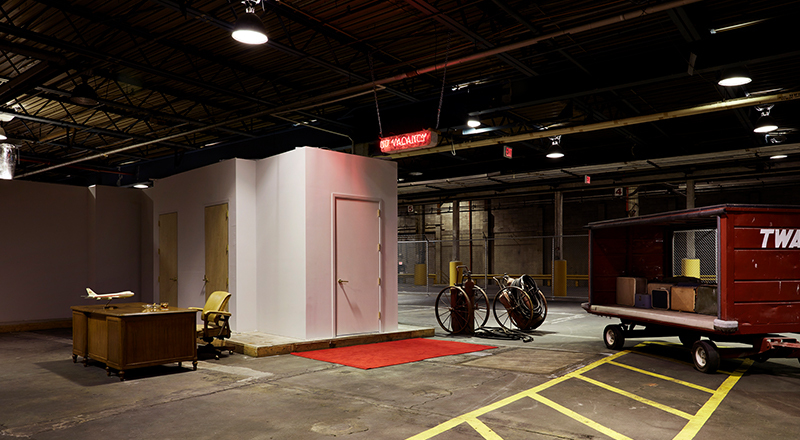 MCR and MORSE Development built the full-scale model guestroom and hotel hallway in a vacant hangar at JFK Airport’s Building 87 and unlocked it to the media on April 17, 2018. 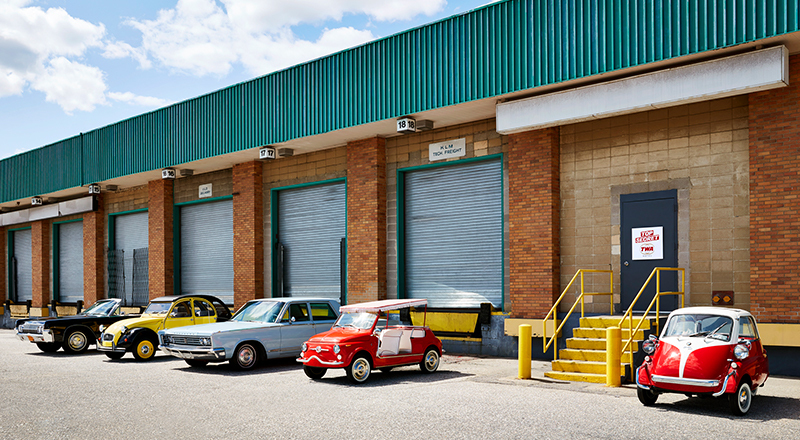 The journalists’ transportation: a fleet of vintage cars, including a 1956 BMW Isetta 300, a 1966 Fiat 500 Island Jolly, a 1966 Chrysler Newport, a 1969 Citroen 2CV and a 1963 Lincoln Continental. 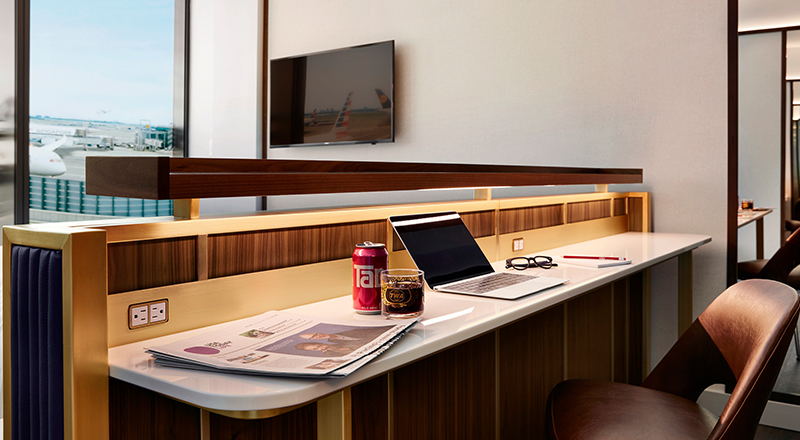 Upon entering JFK Airport’s Building 87, guests are greeted by the desk and chair of aviation pioneer Jack Frye, who served as TWA’s president from 1934 to 1947. 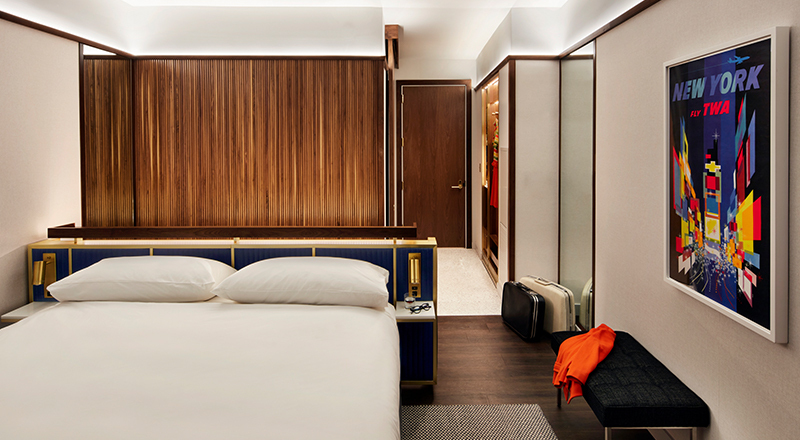 A vintage TWA luggage tug and fire extinguishers lead the way to the plywood structure that houses the model guestroom. Model Adrianne Hick donned a Dalton of America uniform in “jungle green” that was worn by TWA air hostesses during winter seasons from October 1, 1968 until 1971. The uniform will be on display with many others in the TWA Hotel’s museum. See photos and video of the plane’s journey to JFK.